Robbie Levine Foundation – AED (Automated External Defibrillator) & first aid/ CPR courses. 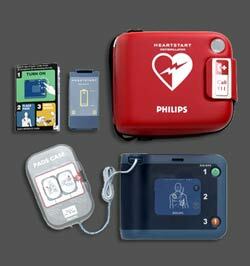 Here are some examples of AEDs. Please contact us for more information on each. A. SCA is one of the leading causes of death in the United States, striking more than 340,000 victims each year. SCA can happen to anyone, anytime, anywhere. Q. Are Automatic External Defibrillators (AEDs) complicated to operate? A. No. AEDs are simple, and offer step-by-step guidance with visual icons and clear, calm voice commands that can match the responder's pace. The device generally includes CPR coaching, which provides voice insturctios, and audio cues for rescue breathing and chest compressions. There is usually a way to use visual cures as well, which can be used in situations where hearing voices instructions is a challenge. Some differences exist between different brands/models of AEDs. Q. Could the defibrillator inadvertently hurt the emergency victim? A. No. Shock terapy will not be delivered if the device determines that the heart's rhythm is not shockable, even if the responder presses the shock button. Q. Can the AED be used on anyone? A. Defibrillators are safe for all ages when used appropriately. Q. 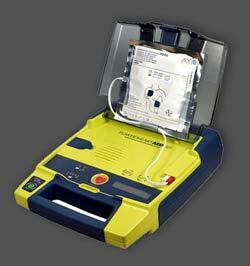 Why is it so important to have the AED so easily accesible? A. For maximum effect, the AED should be administerd within the first three minutes of the SCA. For every minute after that, the survival chance diminishes by approximately 10%. Q. Is training required to use an AED? A. Yes, training is required. You will receive a two year AED/CPR certification upon completeing a simple course. The course lasts approximately three to five hours. Certification is offerered through the American Heart Association, the National Safety Council, and the Red Cross.